Dual-Intent Visas allow a person to enter the United States on a temporary basis for work purposes. However, these visas, such as H and L visas, differ from other classifications such as B-1, B-2, and F-1 because dual-intent visas permit a person to intend to remain in the United States permanently. In other words, a person can get a dual-intent visa without having to prove that they will go back to their home country at the end of their permitted stay in the United States. Any person applying for a visa to the U.S. is required to demonstrate their intent when applying for their visa. Temporary nonimmigrant visas can be obtained much quicker than green cards, which allow a person to live and work in the United States indefinitely. Some green card processes can take a decade or more. If you are an employer in Houston seeking to hire a person from another country for a permanent position, you may be able to obtain a dual-intent visa to circumvent that long wait time. The person will be able to work with a nonimmigrant visa while awaiting lawful permanent resident status. If you are looking to recruit an employee for a permanent position in the Houston area, don’t be discouraged by the long wait times for a green card. A dual-intent visa may be an option to remedy that issue. Kathryn Karam is a Houston immigration lawyer who can review your situation, help determine if a dual-intent visa is available, and help you obtain one for the potential employee. Kathryn Karam has extensive experience working with employers big and small on matters like dual-intent visas. She excels at finding innovative solutions to the sometimes complex problems that can arise in an immigration context. Call Karam Immigration law today at (832) 582-0620 to schedule a consultation to discuss your immigration issues. Kathryn Karam serves the Houston area, including the Galleria Area, Greenway Plaza, the Energy Corridor, The Woodlands, Cypress and Clear Lake. Every visa is either a nonimmigrant visa or an immigrant visa. Nonimmigrant means temporary. Nonimmigrant visas are issued to people for temporary periods, while immigrant visas are issued to people seeking to move to the U.S. permanently or indefinitely. The U.S. Department of State is very strict about enforcing intent for visas. A person seeking one of many nonimmigrant visas is presumed to have immigrant intent, and a Consulate or Embassy will deny the visa unless he or she can prove otherwise. Even if a visa is issued to a person, U.S. Customs and Border Protection may determine at the port of entry that person with a nonimmigrant visa intends to remain in the United States permanently and deny the person entry. Immigrant visas can take a very long time to acquire. Fortunately, several temporary worker visas are classified as “dual-intent." With a dual-intent visa, there is no presumption of intent. A person with such a visa may work in the Gulf Coast region and seek lawful permanent resident status while working here. H-1B Visas: Employees who work in a specialty occupation may qualify for these visas. The jobs require at least a bachelor's degree and/or some kind of highly specialized knowledge. H-3 Visas: These visas are for employees coming to the United States to receive special training. L-1 Visas: These are for employees who work for a multinational company and transfer to an office, branch or facility in the Houston area. In addition, the visas of spouses and children of these employees that are under the same category, such as H-4 and L-2 visas, are also dual intent. In recent years, USCIS has also treated O visas and P visas as dual intent. Your employment-based immigration attorney will be able to advise you on whether the nonimmigrant visa you are seeking may be a dual-intent visa. If you are a Houston-area employer seeking to hire a person from outside the United States for a permanent position, a dual-intent nonimmigrant visa may be the solution to having that employee work for you as quickly as possible. 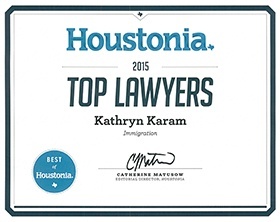 Kathryn Karam is a Houston immigration lawyer who assists businesses and other employers. Call today at (832) 582-0620 to set up a consultation.